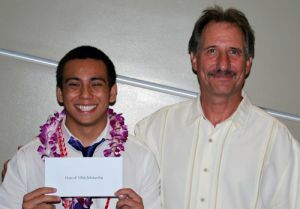 The Alredo Fred Sarian Memorial Scholarship is awarded to Kekukuulani Haake. Ms. Haake has been accepted at North Idaho College, Northeastern Junior College, and University of Hawaii- Maui campus. Kekukuulani was unable to attend. The Boss Frog's Dive and Surf Scholarship is awarded to Ezra Baccar. Ezra has been accepted at the University of Rochester where she will pursue study in a medical field. Presenting the award is Jeff Rogers. 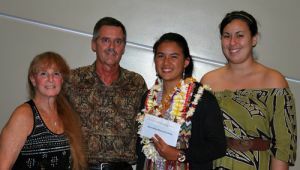 The Central Pacific Bank Scholarship is awarded to Jeannie Ramelb. Jeannie plans to enroll at the University of Hawaii, Manoa campus where she plans major in mathematics. 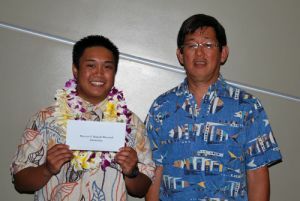 Presenting the award is Lahaina Branch Manager, Issac Parilla. The Class of 1956 Scholarship is presented to Reilly Pasion. Reilly plans a major in secondary education at Colorado State University or the University of Colorado. LHSF Board President Mark Tillman presented. The Fred Izumi Legacy Scholarship was awarded to Bailey Pendergast. Bailey has been accepted at the University of Maryland, Villanova University and State University of New York at Cortland. Bailey in interested in the field of criminology. LHSF Board member Rob Shelton presented. The Front Street Scholarship was back for its second year and was awarded to ​Chelsey Erickson-Vierra. Chelsey has been accepted at University of Hawaii Hilo and Maui Campuses. She plans to pursue studies in a medical field. The Front Street Scholarship provides a renewable scholarship of up to $35,000 a year. Pictured (L to R), presenter Leslie Hiraga, Chelsey Erickson-Vierra, Louise Abihai, Lana Vierra and Alvin Vierra. Last year's recipient, Jeremy Briones de Gracia, received a renewal for his scholarship. The H&K Takenaga Legacy Scholarship is awarded to Marella Galace. Marella has been accepted at the Univerity of Hawaii at Manoa and UH-Maui College. She plans to pursue study in nursing. Presenting the award was LHSF Board member, Betty Sakamoto. The Hotta Memorial Scholarship is awarded to Gaylord Garcia. Gaylord has been accepted at Brandeis University, American University and the University of Hawaii. He wants to pursue a career in medicine. Presenting the award was Kazuichi Hamasaki. 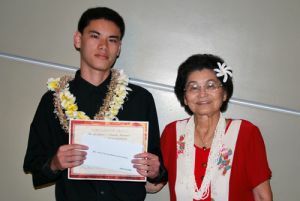 The Ka Ipukukui Scholarship is awarded to Rhys Lendio. 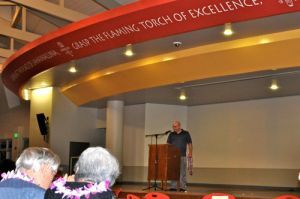 The scholarship is made available from funds donated by former Lahainaluna High School Principal Mike Nakano. Rhys plans to pursue a major in communications and journalism at one of the four institutions where he has gained acceptance. Board member Lester Nakamoto presented. 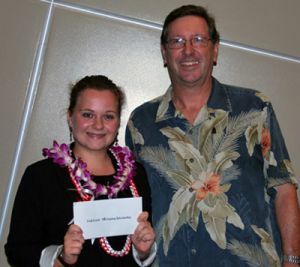 The second scholarship in its debut year was the Krause Chiropractic Scholarship, which was awarded to Hope Morikawa. Hope was unable to attend. Dr. Krause presented. 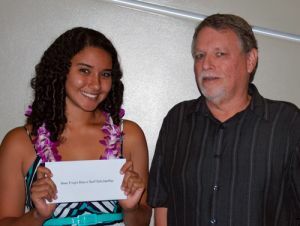 The Lahainaluna High School Foundation was pleased to award its AOHT Scholarship to Leslie Mina. Leslie has been accepted at four universities located in Nevada, Arizona and Hawaii. She plans to major in engineering. Vincent Magno. Vincent has been accepted at the University of Washinton, the University of California at Davis an University of Portland. He plans to pursue study in medicine. 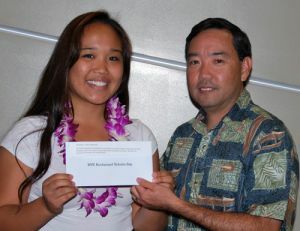 The Lahainaluna Boarder’s Association is pleased to present the Boarder’s Association Scholarship to Jessica Wallace. Jessica plans to attend Pacific Lutheran University with a major in business administration. 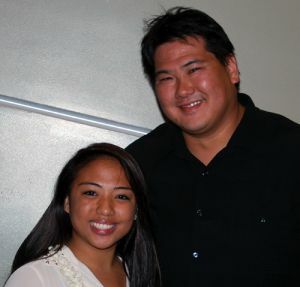 LHSF Board Vice-President and LHS Boarder's Association President Craig Murakami presented. The Illocandia Scholarship was awarded to Abigail Haduca (R). Abigail has been accepted at the Univerisity of Nevada at Reno where she plans to study oncologic nursing. LHSF Board member and Boarding Dept. staff, Susan Yap presented. 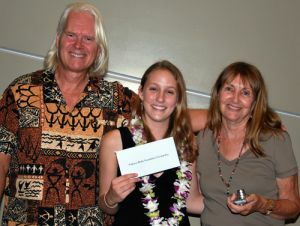 The Makana Aloha Foundation Scholarship is awarded to Haley Robb. Presenting are Gunars & JoRene Valkirs. Receiving scholarship renewals were Joshua Gaastra and Emma Baccar. 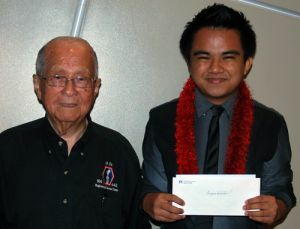 The Maureen S. Ariyoshi Memorial Scholarship is awarded to Andrew-Ray Espiritu. Andrew-Ray has been accepted at the University of Nevada at Las Vegas where he will pursue a degree in hospitality management. Reed Ariyoshi presented. Leilani’s Restaurant on the Beach is pleased to award a scholarship to Ryan Ragudo (2nd from left). Ryan plans to pursue a study in business at either Santa Barbara City College or the University of Hawaii at Manoa. Presenting was Jason Donez. Kimo’s Restaurant Scholarship is presented to Aja Toscano (4th). Aja plans to major in communication at one of the four universities where she has gained acceptance. Presenting was Chris Almeroth. Duke’s Restaurant Scolarship is awarded to Julian Bel-Robert (5th). Julian has been accepted at UCLA, UC Berkeley, the University of Washington and Pepperdine University. He plans pursue study in business. Presenting the Duke's award was Sean Helliar. The Roy and Betty Sakamoto Scholarship is awarded to Makenna Stockham. Makenna plans to enroll at Embry-Riddle Aeronautical University where she will pursue studies in global security and intelligence. LHS Alum Roy Sakamoto (R) and LHSF Board member Betty Sakamoto (L) presented. 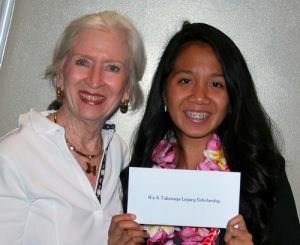 The Sakamotos announced scholarship renewals for Leilani Miranda and Lewilyn Gutierrez, Lahainaluna High School granduates who were previous recipients of the Roy and Betty Sakamoto Scholarship. 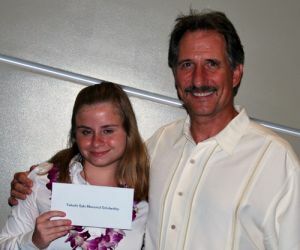 The RVN Restaurant Scholarship is awarded to Kanoelani Delatori. Kanoelani has been accepted at the University of Hawaii Hilo and Chaminade University. She plans to pursue her interest in the medical field. LHSF Board member Lester Nakamoto presented. The S & T Ichiki Scholarship is awarded to Junna Gazman (3rd from left). Junna is interested in business and finance. She has been accepted at the University of Portland, Azusa Pacific University and Pacific University. The S&T Ichiki Scholarship is a renewable scholarship. Also pictured is the mother (L) of An & Jing Hua, who are both being renewed, as well as Cheyenne Baltonado (2nd). Each will receive $5,000. Geral Ichiki presented. The third debut scholarship was the Sgt. 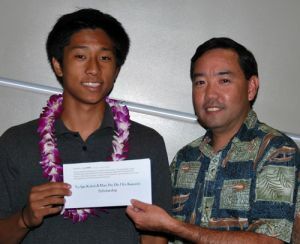 James S. Kusuda Memorial Scholarship which was awarded to Robert Griffith. Robert has been accepted at Colorado State University and plans to major in sociology. Sgt. Kusuda was a police officer for 33 years. He was a boarder at Lahainaluna since the 6th grade when the school was known as Lahainaluna Seminary. He graduated in 1926. Presenting the award is Sgt. Kusuda's daughter and donor, May Fujiwara. The Steven Strong, MD. 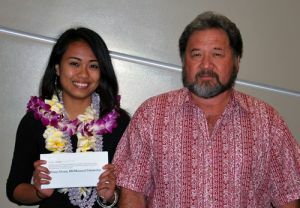 Memorial Scholarship is awarded to Jenina Pascua. Jenina plans to pursue study in pediatric oncology. LHSF Board vice-president presented. 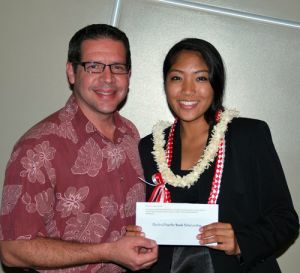 The Tadashi Sato Memorial Scholarship was awarded to Eryn Pendergast. Eryn will be attending Syracuse University. 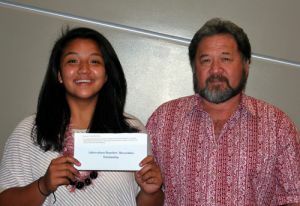 The Territorial Savings Bank Scholarship is awarded to Kayshya Saribay. Kayshya plans to attend the University of Hawaii at Manoa where she hopes to study nursing. Making their debut this year was The Masters at Kaanapali Hillside - Blaze Kalilikane Memorial Scholarship. Blaze was a LHS grad, and employee of The Masters who was killed in an auto accident on December 19, 2012. 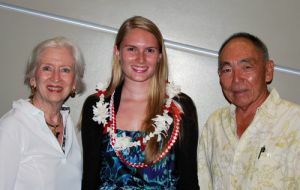 Lois & Roger Ross presented the 1st year scholarship to Jade Chihara. Jade has been accepted at Smith College, she plans to enroll in a liberal arts program. Also pictured is Blaze's sister, Brittany. 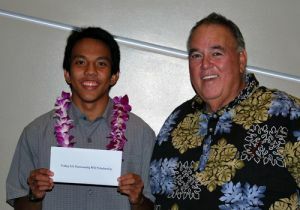 The Valley Isle Federal Credit Union Scholarship is awarded to Mark Alamon. Mark plans to enroll at either Oregon State University, Western Oregon University or Willamette University, where he will pursue studies in technology. LHS alum and LHSF Board member Noosh Nishihara presented. 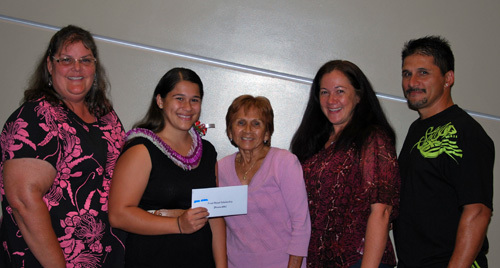 The West Maui Federal Credit Union awards 5 scholarships, each valued at $1,000 to the following students: Esther Arvizu, Makana Kaaikala-Caban, Ivy Tejada, Vincent Sarian and Amanda Matsuda. Thomas Kunishige (L) and Arthur Tabano (R) presented. 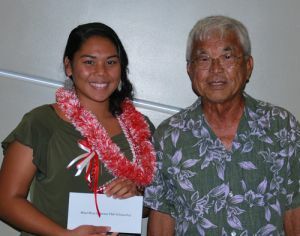 The West Maui Veterans Club Scholarship is awarded to Lakeisha Ching. Lakeisha is interested in studying astronomy at one of the four institutions where she has been accepted. Thomas Kunishige presented.